Published on April 8, 2012. Takes about 9 minutes to read. 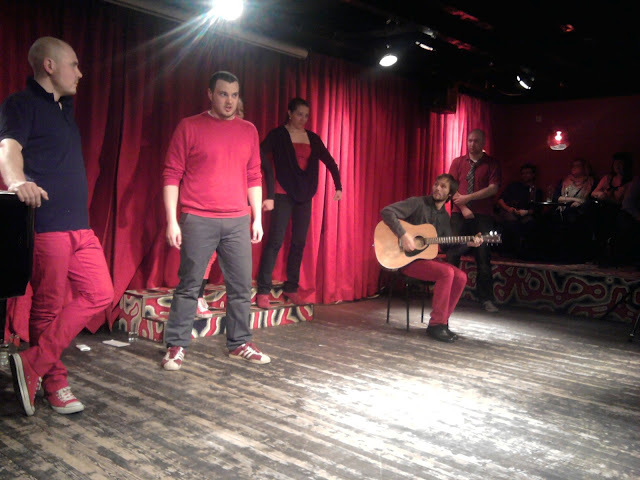 Trent, the awesome Chicago / Finland improviser, contacted Improgrupp Jaa! 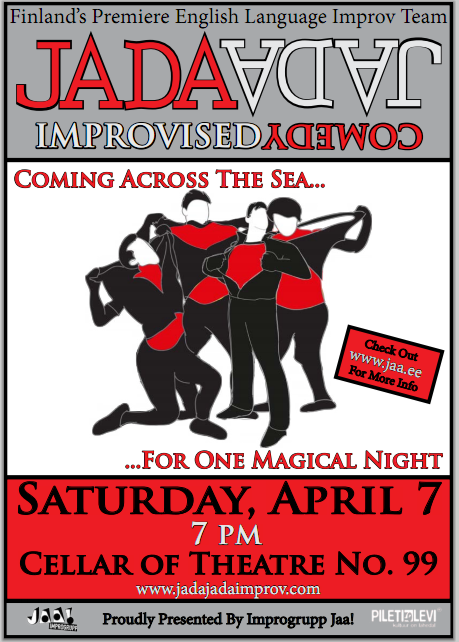 a month or two back and made a suggestion that made me giddy: namely, another workshop (read about the previous one here) for our actors and his teams - JadaJada - first international improv show. Woke up at eleven - after being without sleep for over 30 hours the day before - and couldn’t make it to welcome the boat from Finland that arrived to the port at the same time and had JadaJada as its cargo. Instead, I made it to the venue (Toomklubi) and messed around on the piano with the guys before Rahel arrived with Trent at two-ish to conduct the three hour workshop for Improgrupp Jaa!. There were around twelve of us present - including the guys from the army and Tartu -, no one wanted to miss this opportunity. The atmosphere was high-energy, professional and benevolent, a somewhat different experience for me since all of us had had at least some contact with improv and knew what they were doing. In fact, Trent couldn’t even finish the introduction of the first warm-up game, we had already mastered it and just went with it. We’d chosen to focus the workshop on the classic “Harold” long-form technique and as a side note, some singing. The first half of the workshop went into exploring scene building and character work, creating scenic environments and gathering ideas from the “idea hopper”. I can only say that we improved our skills on initial location building, the rest you can see when you visit our semi-regular shows. The “classic” Harold incorporates some structure and we’d chosen to ignore it up until now… but now that department got some improvement. 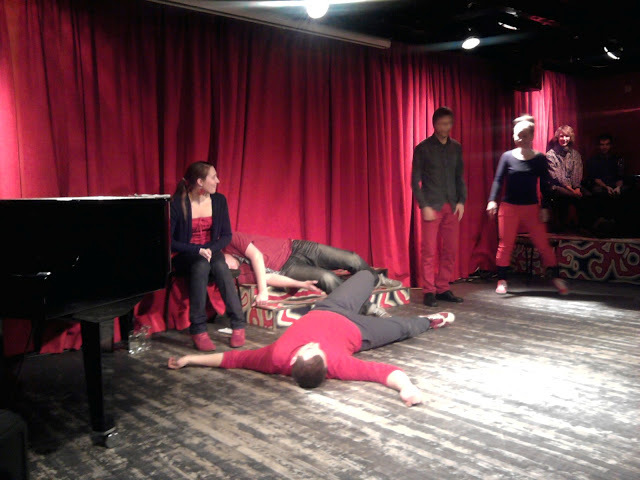 Even improvisers have brain-freezes sometimes. I wanted to say I wrote an app for that, but the topic seemed irrelevant at the time. Character-work was… interesting. It’s always nice to see a scene where emotional depth is in involved. An exercise involving just that was practiced. Namely, what if, instead of 3 minutes, your scene would last half an hour… because that, apparently, is what they do with extreme skill in Chicago. So taking ones time was the goal. You have two characters on stage, each having a character “filter” and you have to interact, not bluntly, not fast, but by developing the relationship to its highest point, like they do in traditional theater. Musical improv followed. We tried some song techniques and I provided some simple musical background on the piano. Half an hour of music-improv is not nearly enough to satisfy my craving for this particular genre. I mean, it’s just so… exhilirating to watch when done right. In fact, as we were wrapping up, the Finnish team arrived and a bubble of energy that was Senja (actress from JadaJada), peeked in, saying the song we were singing sounded amazing. The time was getting late, we had a show to set up with just under an hour to spare to organizational matters. The hungry ones went for lunch (the will-fueled ones stayed behind), I went to work with setting up a live broadcast (we had people in the States and Spain who challenged me to invent teleportation) and JadaJada went about making everyones lives merrier (or distracting - apologies, Rahel!). Senja and Trent did a number of guitar (Trent)- accompanied songs that were, plainly put, amazing. I can’t put in words how much I enjoyed the spontaneous, care-free and completely addictive chemistry between Senja and Trent. The duets came out just right and I had trouble focusing on IT technicalities. In fact, as the first audience members began to arrive, I was flying about, trying to solve the internet issues and attend group warm-up at the same time - since, this time, I didn’t manage to convince Rahel to let me “off the hook” in terms of performing. 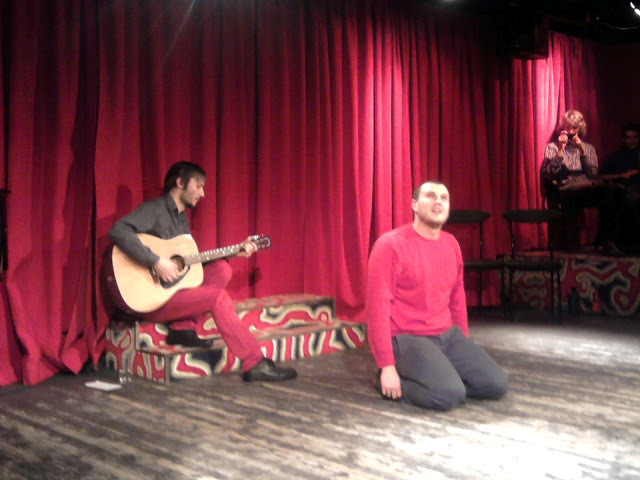 Don’t get me wrong, I like being on stage, but sometimes everyone needs a breather - which, unfortunately for some (no names named) is a bummer and misfortune… and even though the actors got compliments afterwards, being the over-criticizing person that I am, I still felt like I could use an extra glass of red wine. As it happens, Mikk, our awesome actor slash my course-mate from collage, managed to get the broadcast working just in time (but not the record function of it, which is a bummer, considering all it took was a press of a button) and the show was on. The studio was moderately full, with the full team of JadaJada sitting at the back; they had agreed to come on stage for two games, “Everybody speakse Estonian” and a group song in English. The performance went… quite well, I didn’t screw up nearly as much as I feared and my fellow actors were even more brilliant and a joy to work with. I particularly enjoyed the bit where the Finns came to try speak Estonian. Everyone thought it was hilarious. Kristo, the new-ish actor (second performance) in our group did really well, being the only person who actually knew Estonian and trying to manage the chaos created by Trent and Senja Finnish-inspired Estonian gibberish. What surprised me was the amount of compliments JadaJada had to share afterwards. The improv filled day ended on a positive note in a local pub. The day started with around two hours of musical improv with Rauno and Martin from 3pm. Then, onwards to NO99 cellar that would serve as the venue for the evening show for JadaJada. Some of the others were already keeping busy, with Rahel looking very much in charge and in her environment. The most joyous sight welcomed the newly arrived company: JadaJada, warming up on stage. The team did a number of familiar warm-up exercises such as You Are The Master, but with such fluidity and energy that was a joy to watch. At one point, Samuel, the music director, said that he’d always wanted to try flying so the group lifted him up and made his body do a full 360 spin… and sometime later/earlier, the actors scattered, singing “This is how we usually start up” in different pitches/variations. Siret, our sassy actor, was sent to the ticketing duties since, apparently, she was a girl and looked pretty. Discrimination! The first guests arrived and most of the organizers grabbed front-row seats (on the floor so don’t blame us, you at the tables). All in all, about half of the seats we’d planned to sell out were taken. But hey, it’s Estonia and the event was a first for both JadaJada and the entire country: to the best of my knowledge, no other foreign, professional improv team has performed here before Trent and his crew. The second half of the show was a traditional long-form, with a song mixed in. The suggestion, “jama” (“trouble” in Eng) was not the best one to give to an international team, but to their credit the resulting story about Jama birds, Jamabots and a burgalor-girl was fun to watch and skillfully played out. Unnoticed to any uninitiated observer, but apparent to improvisers, I saw some very nice display of technical expertise, including “playing the game”, saving the scenes and techniques of teamwork. Very skilled of them. The show concluded with some standup-style pun jokes (assisted by members of Jaa!) and the show ended with a huge round of applause. Wake up on time, this time. Met up with Rauno & Rahel and found JadaJada enjoying their last meal in Estonia sometime later. A walk and some playful conversations later and it was bye-bye for this time as the boat to Finland departed. Not the end, though. Finland International Improv Festival is coming in about a month and I’ll see both old acquaintances and new faces there. There’s something addictive in the positivity of the Trentasaurus. You simply cannot stay negative/passive during one of his workshops… and you do learn a lot there, nevermind your previous level. The most enjoyable moments of the weekend was not our show, nor JadaJada’s, but the spontaneous songs accompanied by Trent/ Samuel on the guitar. You know how conflict is solved in improviser teams? With a duet-battle. Senja’s singing is brilliant and I’d very much like to hear more of it, which I maybe will, at the FIIF. I’ve probably made a lot of grammar/fact mistakes in the above text and possibly misspelled some names. Please use the comments form below to fix them (thanks!). Thanks to everyone involved for the amazing two days and see you @ the FIIF. Some chosen photos (by my crappy camera) from the show. Cast: JadaJada Improv.